The graph below shows the “fingerprint” of an unknown compound. The high peaks identify various ingredients within the Polymer. We compare the “fingerprint” to known compounds to determine the best match. For many good business reasons, overseas outsourcing is more common than ever. But, if there is a problem with an outsourced part, it’s nice to know that local testing is available to help our clients prevent or resolve issues swiftly and accurately. OGP SmartScope™ multi-sensor measurement systems combine optical, laser, and tactile sensors, allowing us to measure parts with more certainty, more accurately, in less time. Zatkoff has two 3-Axis Non-Contact Video Systems, a Flash™ 302 which has capabilities for parts up to 300mm x 300mm x 250mm, and Zip™ 800 which has capabilities up to 800mm x 820mm x 200mm. 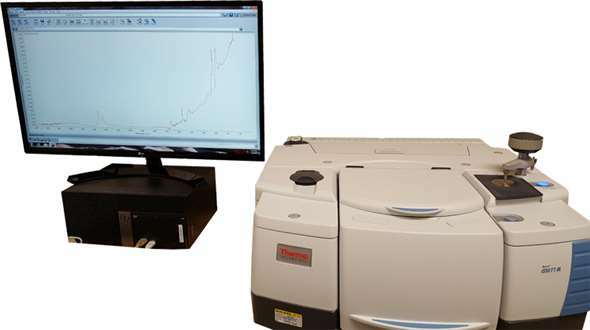 This equipment has the ability to create programs for fast, reliable, repeatable measurements of complex parts with area accuracy of (1.8 + 5L/1000) μm and Z Accuracy up to (1.4 + 5L/1000) μm. Both systems combine state-of-the-art video and autofocus to deliver high productivity with options to add-on Laser, touch probe and mico-probe accessories which make these machines some of the most capable multi-sensor systems available. Compression Set for polymer seals can be a very important aspect on whether or not a seal will function over its lifetime. How much a seal has permanently taken a compression set is based upon the material type as well as application parameters such as temperature, time, and environmental interactions. 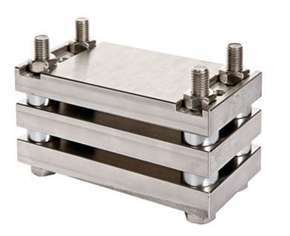 There are two common test methods for determining Compression Set; ASTM D-395 and ASTM D-1414. A constant deflection test is a common way to measures the compression set of a part. 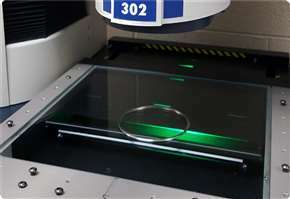 In order to perform this test you first must measure the thickness of a specimen, then place them in a device compressing the seals to 75% of its original thickness. The test fixture is placed in an oven for a determined amount of time at a defined temperature; then the specimen is removed and after a predetermined cooldown time, the thickness is measured again. The compression set is the ratio of how much thickness the seal lost during the test vs how much it was originally compressed. A 0% compression set means the specimen returned to the original thickness, whereas a 100% compression set means it never recovered any of the compression. The formulations of the various polymer types will determine the compression set. Throughout Industry, the hardness of Polymer & Plastics is most commonly measured by the Shore® (Durometer) test. Shore® hardness is the preferred method for testing rubbers, elastomers, and softer plastics, although there are several different scales of hardness for different product types. The Shore® hardness is measured with a Durometer, and is sometimes referred to as 'Durometer hardness'. The hardness value is determined by the penetration of the Durometer into the sample. Because of the resilience of rubbers and plastics, the indentation reading my change over time - so the indentation time is sometimes reported along with the hardness number. The ASTM test method designation is ASTM D2240 and is generally used in North America. Related methods include ISO 7619 and ISO 868; DIN 53505; and JIS K 6253. The results obtained from this test are a useful measure of relative resistance to indentation of various grades of polymers. However, the Shore® Durometer hardness test does not serve well as a predictor of other properties such as strength or resistance to scratches, abrasion, or wear, and should not be used alone for product design specifications. Shore® hardness is often used as a proxy for flexibility (modulus) for the specification of elastomers.